Combine sugar, eggs, butter, and lemon zest in a large mixing bowl. Using an electronic mixer, beat those ingredients on low speed for about 5 mins. Turn off the mixer and stir in rum, evaporated milk, and flour. Scrape the sides and begin mixing again on medium-high speed. Mix well for about 25 minutes until the mixture is smooth and fluffy. Add salt, baking powder, vanilla extract, and almond extract. Stir well. Grease the baking pan and pour the battered mixture only halfway to allow room for the cake to rise. Bake the cake for about 35 minutes. To test, insert a knife or toothpick in the center of the cake. It is fully baked if it comes out clean. Beat all frosting ingredients in a mixer until smooth, light, and fluffy. Add more milk as needed until desired consistency is reached. 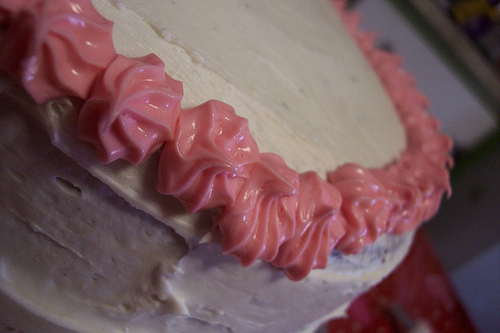 Spread the frosting after the cake has cooled down.